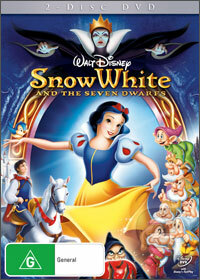 Disney's Snow White and the Seven Dwarfs is truly a transgenerational movie that knows no boundaries and finally this 1937 classic has received a much needed release on DVD with exceptional picture quality and those oh so memorable songs. On a side note, I remember seeing this movie when I was child and even my father remembered seeing this classic when he was a kid which just proves the scope and diversity of this movie. As soon as the disc went into our player, the emotions from my childhood came flooding back and I was instantly drawn into this magic tale about the kind hearted princess called Snow White and a wickedly dark Queen. Of course almost everyone knows the tale of Snow White and the Seven Dwarfs, however the endless magic of this tale will ensure that a new generation of fans will also fall in love with it. The story begins with the wicked Queen who asks her magic mirror who is the fairest one of all. For years, the Queen was the fairest one of all, however unfortunately one day, this all changes and the mirror proclaims Snow White as the fairest one of all. Outraged by this decision, the Queen orders her Huntsmen to murder her beautiful step daughter, whether this is triggered by jealous, insanity or both, only the Queen knows. Thankfully the Huntsmen is unable to perform this task and even worse, bring the heart of Snow White back to her as proof. He warns the princess and from there she flees into the forests, only to meet the seven dwarfs. With parallels to Goldilocks and the Three Bears, Snow White enters their home, cleans it up and falls asleep in their beds until the the 7 dwarfs return to find an unexpected visitor and immediately, just as do the forest creatures, they fall in love with Snow White... even Grumpy. Sadly while Snow White is hiding with Bashful, Doc, Dopey, Grumpy, Happy, Sleepy and Sneezy, the seven dwarfs, the Queen finds out that the Huntsmen has brought her not the heart of a human but the heart of a pig. Taking matters into her own hand, the Queen creates a dastardly spell that turns her into an old hag in order to give the beautiful princess a magic Apple that will forever keep her asleep. Unfortunately Snow White succumbs to the Queen and without spoiling the story anymore, it's up to the seven dwarfs and a handsome prince to save the day. The animation for a movie from 1937 is thoroughly impressive that boasts exceptional picture quality and it almost looks like a painting come to life. The only drawback to the movie is unfortunately the audio quality, however thankfully once you get immersed into the movie, it becomes a thing of the past. At 72 years of age, you'll be pushing it to look this good! Of course, the songs in the movie are truly memorable classics like "Heigh Ho, Heigh Ho, we're off to work we go!" and is probably an element of the film which made it so popular among all viewers. Featuring a variety of genres in this classic tale from comedy to romance and adventure, Snow White and the Seven Dwarfs is a must have collection for almost everyone. Whether you have children or wish to walk down memory lane, this movie can be watched time and time again. Add in a bonus discs with some additional magical extras and there's no complaining about this Disney classic.